People often ask me “Why frogs?” and this has been an extremely difficult question for me to answer. I have been passionate about amphibians for as long as I can remember, I don’t know why, I just simply love amphibians, especially toads! When I look back at my childhood over half a century ago, I remember finding my first amphibian, it was a beautiful female brick red Common Toad (Bufo bufo). I was four or five years old at the time, and she just sat patiently, filling up my small hand, smiling at me – from that time on I was hooked! Dr. Phil Bishop has worked on amphibian conservation projects in many parts of the world, including Africa, Borneo, Australia, Chile, Madagascar and the UK. Like many amphibian conservationists, I ended up with a garden filled with frogs, toads, newts and snakes and my path was set to become a herpetologist. I studied Zoology at Cardiff University and went on to do a Master’s degree in tropical medicine and parasitology. However, near the end of my Master’s my eminent parasitologist of a supervisor gave me some great advice, he came into my lab (which housed thirty-two species of amphibians in twenty different aquaria, none of which were relevant to my thesis) and said to me “I think you should be working on amphibians!”. So, I took his advice and was fortunate enough to get a PhD scholarship to study anuran communication and social behaviour under the tutelage of Prof Neville Passmore in South Africa. Going to South Africa to study frogs made me feel like a kid in a candy shop, so many amazing frogs and toads, beautiful colours and sounds, so many weird and wonderful behaviours, a fantastic place to be to study amphibians. We must do everything in our power to save amphibians, we should be working hard to protect them – like our lives depend on them, because it does! Towards the end of my PhD I was fortunate to be able to attend the First World Congress of Herpetology and of course it was at this conference that we started to realise that global amphibian declines were well under way and we needed to be concerned. On my return to South Africa I felt that we were in a good position as there was no evidence of any declines, but I also felt it was very important to take a snapshot in time and conduct an inventory of how many species we had, where they lived and how were they doing. So, I started the Southern African Frog Atlas Project and tried to convince all the 4×4, tree-hugging birders, that ‘birding’ is old hat and if they really wanted to be cool they would go frogging with their tape recorders! To cut a long story short, with hundreds of volunteers and recordings it took ten years to complete the “Atlas and Red Data Book of the Frogs of South Africa, Lesotho and Swaziland” which provided the accurate distribution and population status of every species of frog in the southern African region. This was the first time that such a project had been attempted at such a large multi-national level. At the end of the 1990s I moved to New Zealand to study the incredibly unusual and archaic Leiopelma species. New Zealand has a raft of unusual species like the tuatara, and flightless birds like the kiwi and kakapo and I was concerned when I first arrived to see that the birds were attracting all the conservation funds and the frogs, that were more threatened, seemed to have been forgotten about. 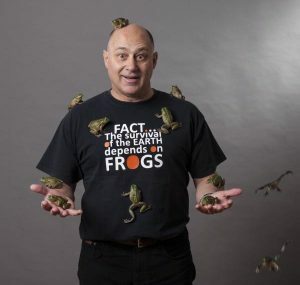 So, I began a crusade to raise awareness about the plight of New Zealand’s native frogs and in so doing became more and more involved in global amphibian conservation. I became acutely aware that we needed a global campaign and I attended the planning meeting for the Year of the Frog in Rotterdam and later became the Year of the Frog Ambassador for New Zealand (it’s time we had another campaign like this!). As more and more amphibian declines were being reported it was becoming clearer that we weren’t winning the battle and many scientists felt there was the need to form a global coordinating body which would have oversight of global amphibian conservation. 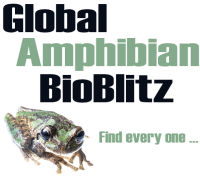 With generous financial contributions from several institutions and the late George Rabb the Amphibian Survival Alliance was formed in 2011 and I was appointed as their Chief Scientist (a position I still hold today). In 2013 I was also appointed as the Co-Chair (along with Ariadne Angulo) of the IUCN SSC Amphibian Specialist Group, and in these two positions I strive to help coordinate global amphibian conservation to ensure that our children, grandchildren and great grandchildren, will still have amphibians in their lives. Amphibians have been very kind to me, I have worked on amphibian conservation projects in many parts of the world, like Africa, Borneo, Australia, Chile, Madagascar and the UK and amphibians have introduced me to some amazing people (some of them my childhood heroes) like Sir David Attenborough, Dr Dame Jane Goodall, Xena Princess Warrior, Prince Charles and Camilla, and the great late George Rabb. 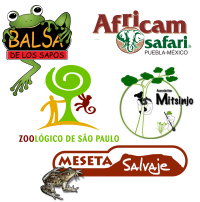 Check out our other Amphibian Advocates!